Graham Jones, the Internet Psychologist, sales expert and university lecturer, and Derek Arden the UK’s Number One Negotiation Speaker, negotiation expert and inspirational leader invite you to join them for a one-day exclusive masterclass that will dramatically improve your business. Graham and Derek are two of the UK’s leading experts on the art and science of presenting, selling, influencing and negotiating – both face to face and on the Internet. 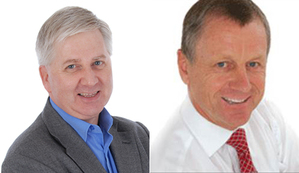 Derek and Graham are award-winning speakers, prolific authors and business consultants. They are going to share their knowledge of what they have learnt over a combined 68 years as practitioners. Join Derek and Graham for an exclusive small group masterclass where you will get all of your individual question answered so that you can improve your business with more sales, higher prices all with a better work-life balance. There are 17 sessions each lasting 17 minutes. This is a quick-fire, quick-learning, fact-packed day. Session 1: Leadership starts with you! Session 3: Personal branding, what are your USP’s? You will get free material worth over £500 simply by attending. Not only will you get Graham and Derek’s expertise, energy and wisdom you will get copies of their books, DVD, programmes, audios and exclusive entry to their platinum programmes. Your ticket includes unlimited tea, coffee, water as well as lunch. Your ticket includes your lunch and all refreshments. Prices are subject to Value Added Tax. If you have a discount code, this can be added when you complete the booking form below. Please let us know if you have any special dietary requirements. If you select "other" we will contact you to find out your precise needs. If you have any disabilities which may impact upon your participation please let us know. If you select "other" we will contact you to find out your precise needs. Who recommended you attend this event? If someone recommended you attend, please give us their name so we can thank them. Do you have a discount code? If so, please enter it below. PRIVACY: Your details will be added to a list solely for the administration of this event and for any follow-up emails. You can request deletion from that list at any time.